You don’t have to travel far from the city to see the best that the Brisbane region has to offer. From picture-perfect lakes and soaring peaks to rainforests and historical attractions, we’ve curated a list of some of the best road trips from Brisbane. These are our top three Brisbane itineraries, showcasing some of the sunshine capital’s most spectacular sites - and, best of all, they’re all accessible in your campervan! One of the more scenic drives Brisbane travellers can take, this gorgeous self driving route can be done in only a few hours, but to truly appreciate the beauty of the region, slow down and take it all in, stopping at quaint country towns, marvelling at the scenery and admiring the natural attractions. To begin your trip from Brisbane, head 34km along the M3 to Beenleigh, before heading inland to the picturesque Tamborine Mountain on Route 90. Drink in the magnificent scenery of the volcanic region and Lamington National Park, including the pretty village of Canungra, before heading back onto Route 90 for your 25km drive towards Beaudesert – the heart of the scenic rim. The Meebun Recreation Area is a great spot to take a break with picnic tables, shelters and barbeques. You can also head to Lake Wyaralong for some paddling or to enjoy its mountain bike trails. From there, head west for about 28km to the bustling agricultural town of Boonah known for its tasty local produce and talented artisans. It’s an ideal base for boating, fishing, scenic walks and camping. It’s also home to a great local airfield which offers glider and light aircraft flights to give you a different view of the region. From Boonah, the quaint little town of Cunningham Highway town of Aratula awaits – and so do its trademark chocolate eclairs! There’s also plenty of arts and crafts stores to browse and an antique shop. From Aratula, take a 10km side trip south to nearby Moogerah Peaks and Main Range National Parks, as well as Lakes Moogerah and Maroon. You’ll be well rewarded with breathtaking views across the lakes, and at Haigh Park you can walk across the 219m long and 38m high Moogerah Dam wall. Heading north along the Cunningham Highway, stop in at Barton’s Rose Farm in Kalbar where you can enjoy a Devonshire tea and buy some gorgeous roses. Just 20km north is the Summer Land Camel Farm to try some camel milk or cheese or if you like your transport a little speedier, head to Willowbank, 17km north, the home of Willowbank Raceway. The region’s leading drag racing facility offers a year-round program of drag racing entertainment. From Willowbank, it’s a leisurely 50km drive back to Brisbane. Where to stay - Try your hand at national park camping at one of the many parks along the route. Check booking requirements, options and facilities at Queensland National Parks booking service. 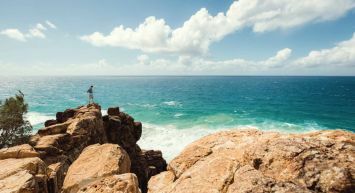 Queensland is known for its gorgeous coastline and arguably, one of the finest stretches examples from Brisbane up past the Sunshine Coast to the Great Sandy National Park and the seaside village of Rainbow Beach. From Brisbane, head 105km up to the Sunshine Coast along the M1. Make a stop between Beerwah and Beerburrum to admire the gorgeous volcanic Glasshouse Mountains that tower over the region. Take your time cruising up the coast from Caloundra to Cooroy, taking the coastal route to visit the seaside towns of Mooloolaba, Coolum, Peregian and the famous Noosa Heads. From Noosa, head inland to Cooroy or backtrack slightly to visit the sleepy little town of Eumundi (home to the famous markets - a must do! ), before heading 45km north towards the former gold rush town of Gympie. The Gympie Gold Mining and Historical Museum there is well worth a visit. Take the Tin Can Bay Road approximately 73km towards Rainbow Beach, driving through the gorgeous Toolara State Forest, home to abundant wildlife including kangaroos, yellow-tailed black cockatoos and the occasional wild brumby. Heading through the Great Sandy National Park, you’ll arrive at Rainbow Beach, the perfect place to rest and unwind, enjoying expansive views across the Great Sandy Strait towards Fraser Island. There are numerous caravan and holiday parks to choose from here. Save time for a day trip over to the heritage-listed Fraser Island from Inskip Point and be sure to hire a 4WD to get around (book in Rainbow Beach) and take in all the natural beauty the island has to offer, from freshwater lakes to towering forests and expansive, untamed beaches. Fraser Island really is the jewel of the region. From Rainbow Beach, make the return trip to Brisbane, perhaps even calling in at sleepy Tin Can Bay for fish and chips before starting your 230km journey home. 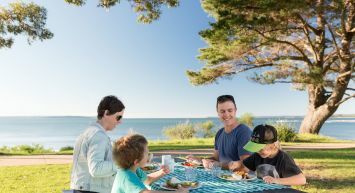 You’ll be spoilt for choice for places to park your campervan up this remarkable stretch of coast, however, for convenience and modern amenities, try the range of BIG4 holiday parks at Sandstone Point, Caloundra, Maroochydore, and Tewantin. On 1 January 1866, the first Cobb & Co mail service in Queensland commenced, from Brisbane to Ipswich. Passengers heading further west took a train from Ipswich to Grandchester and then another Cobb & Co coach took them from there to Toowoomba. Today, there’s no need for any other mode of transport than a motorhome, allowing you to take in the sights, and history, of this iconic Aussie touring route. As one of the shorter Brisbane drives, this trip features on our best road trips from Brisbane list as a good one or two day trip to add to the itinerary. To start your journey from Brisbane, drive 40km south-west to Ipswich, and keep an eye out for the distinctive coach wheel signs that will guide your way to Toowoomba. Just as Cobb & Co’s passengers needed occasional rest stops, so do modern-day travellers. Along the route, there are three ‘staging posts’, in Rosewood, Forest Hill and Gatton, where there are toilets and refreshments available seven days. Some highlights include Walloon, the first stop on Queensland’s first railway. This area was once known as ‘Ten Mile Peg’, its approximate distance by the old track from Ipswich. About 23km along the Rosewood-Laidley Road, you’ll find Grandchester, the first terminus on the railway. Nearby is Queensland’s first and oldest railway dam, built in 1894 to ensure a reliable water supply for the steam locomotives. Make a stop at the historic Grandchester Steam Sawmill and the Grandchester Stage Coach Company. From Grandchester, head towards Gatton, known as ‘Australia’s salad bowl’ before making your way to beautiful Toowoomba, the capital of the Darling Downs. Here make sure you visit the Cobb & Co Museum featuring Australia’s finest collection of horse-drawn vehicles including Cobb & Co coaches, farm wagons, hawkers’ barrows, delivery carts and buggies. To extend your journey, there is an optional route from Toowoomba to Brisbane via Esk (Highway 85) and Lake Wivenhoe (A17). Where to stay - There are plenty of local options in small towns, or try the BIG4 Toowoomba Garden City Holiday Park in Toowoomba. Inspired to do a Brisbane roadtrip? To get started on this journey, book a Britz campervan today. Or check out our latest deals and specials here. For some more travel itineraries around Queensland read our Discover Brisbane, Cairns to Brisbane Roadtrip and Northern Exposure piece.